Director Robert Zemeckis (Back to the Future, Contact, Polar Express, Cast Away) returns to live action films after ten years’ experimentation with motion capture technology. He touches down with Flight, starring Denzel Washington, Kelly Reilly, Don Cheadle and Bruce Greenwood. It’s the story of a pilot who heroically saves a plane from crashing, but then has to face the subsequent investigation into the incident, as well as confront some personal demons. Simply put, this is a film about alcoholism. 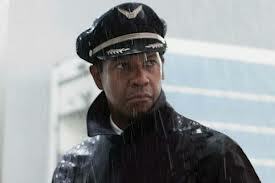 Denzel Washington plays Whip Whitaker, a veteran pilot and functioning alcoholic, who has spent the best part of his life skilfully masking his addictions. The very first scene of the film really sets the tone for what’s to come. Whip wakes up in the company of a birthday-suited beautiful woman, takes a call from his angry ex-wife, swigs from a corona, smokes a cigarette and does a considerable line of cocaine. They may as well have used a big neon flashing sign that reads: “Whip has a drug and alcohol problem”. So with subtlety out the window, Whip gets dressed and heads off to work, looking like death warmed up, and flies off with 102 souls on board. A short time into the flight, the plane experiences problems and goes into a nose dive, requiring Whip to take emergency action. This is a fantastically shot sequence. There is so much tension in the scene and the technical aspects are handled superbly. (It’s interesting to note that Cast Away was the last live action film that Robert Zemeckis directed and also contains a plane crash in its opening moments). After a brilliant manoeuvre where Whip inverts the plane in order to regain balance, he manages to crash land it in a field with far less damage and loss of life than would have otherwise occurred. Whip is dragged from the plane and wakes up in a hospital some time later. It’s at this point that the focus of the film turns to Whip’s alcohol abuse. This is possibly the finest performance I have ever seen from Denzel Washington. 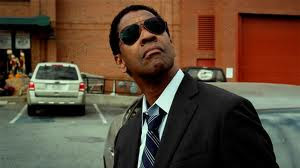 I cringe when people tell me how amazing they thought he was in Training Day because in my opinion that was seemingly a couple of hours of Denzel being Denzel; there was no nuance to his performance. I believe Denzel Washington is both a movie star and great actor; most people in Hollywood are usually one or the other but seldom both. Sure, he has plenty of films that I’m sure were accompanied by considerable pay checks, but he also has the ability to bring depth and heart to any character he plays. I respected the fact that this was not a flattering role; several shots show how much weight Washington had to put on for the character. 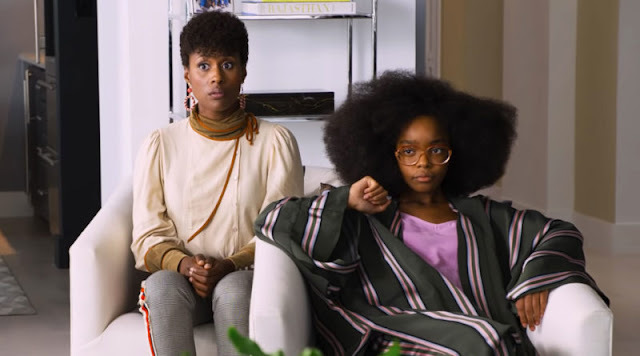 It was smart casting in that Denzel Washington, a likeable and relatable actor, is seen engaging in despicable acts, which is a good way to challenge the audience. The supporting cast is a bit of mixed bag. Kelly Reilly plays Nicole, a heroin addict attempting to get clean, who meets Whip when he is recovering in hospital. Whilst Riley is a fine actress in her own right, I was disappointed that Hollywood continues to use borderline models to portray heroin junkies. There are no signs of addiction and no trace physically of a drug career except for a few cute tattoos here and there. John Goodman has a few forgettable moments as Whip’s best friend/drug dealer. He bordered on the cartoonish, which is a shame because I’m a massive Goodman fan. Don Cheadle provided the counterweight to Denzel’s outlandish moments and it didn’t look as though he was been tested too much by the material. Despite the excellence of Washington’s performance, Flight has a few issues that I’m still reflecting upon. Firstly, the music selection was borderline offensive in its blatancy. Music should be in a film to either set mood or to build tension, not to explain the story as its happening. For example, ‘Under the bridge’ by Red Hot Chilli Peppers during a heroin injecting scene, or Rolling Stone’s ‘Sympathy for the Devil’ as John Goodman’s bad boy character is introduced. It’s like being smacked over the head with the book of tropes. Other examples of rather heavy handed devices being employed include lingering shots on alcohol bottles and drug paraphernalia, and a set of characters repeatedly exclaiming “praise Jesus!” in an irritatingly unnecessary fashion. It just took me out of the film. That being said, these aren’t reasons to miss it. 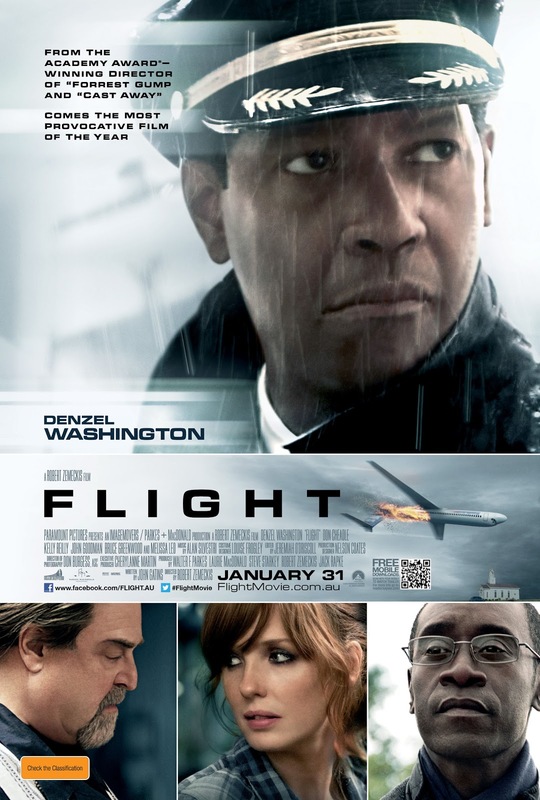 Flight is a film that I can safely recommend to people just for the plane sequence and Denzel Washington’s performance. I’m struggling to think of a better drunk performance on screen in the past ten years. Further, I think many people will come away from this story with hope and insight. Whilst Daniel Day Lewis may already have one hand on the Academy award, I truly hope Denzel Washington is acknowledged for his fine efforts here.